Volunteer Drivers are integral to delivering FREE early childhood programs. Volunteer Drivers move a 40' reconfigured bus ( the ORCA Bus) to scheduled stops/visits to all areas of the Regional District of Powell River. The ORCA Bus parks for the duration of the program and is then returned to the storage yard. Typically, Volunteer Drivers spend 3 to 4 hours on each trip. There are opportunities for drop off and/or pick up options that require less of a time commitment. The ORCA bus has been on the road since February 2009. 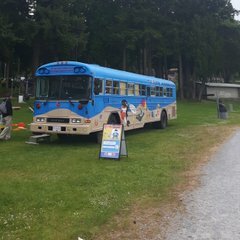 Today, the bus delivers a Strong Start outreach program for SD#47, The City of Powell River, Supported Child Development (inclusion Powell River), Tla,amin Health, and a plethora of other activities at various community events in Powell River. The bus offers programmed stops and 'pop - ups' from Saltery Bay to Lund and Texada Island. On the Road with Children's Activities (ORCA) is a partnership of Powell River & District United Way, School District 47, and the BC Government through Ministry of Children and Family Development. We host early years programs for children age 0-6 years that focuses on play based learning and fun! The bus travels from Saltery Bay to Lund as well as Texada island and all the regions in between!